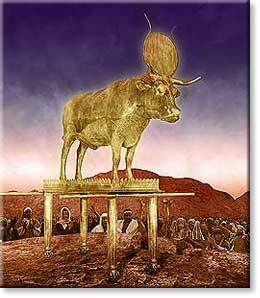 Idolatry: An Inexact Lesson | Yo, Yenta! So after making 10 Commandment tablets out of paper bags last week (we crumpled them up to make them look old, then I handed out strips of each commandment and challenged the kinders to glue them on in numerical order — turns out, glue sticks are enough of a challenge), we finally got to the Golden Calf shenanigans in yesterday’s Shalom School lesson. You already know that Moses goes up Mount Sinai to study some Torah from the Source for 40 days and nights, but the freed Israelites got impatient and had Moses’ bro Aaron melt down their baubles and make something shiny they could worship. When Moses came down, he saw that the people he’d gone through all this trouble to save were not following the very simple directions he’d left, and he was pissed. In fact, I told my charges, he was so mad he broke the tablets he’d spent all that time scraping out so that these nudniks would have something to reference the next time they forgot the basic rules of the game. “Have you ever been so mad that you broke something you loved?” I asked my Shalom Schoolers. “I once broke my sister’s favorite pencil because she wouldn’t let me use it,” confessed one boy with a mournful look. “SIX HUNDRED AND THIRTEEN!” my smarty Jewish kids shouted. “Right! So that’s a lot to remember, and when we don’t get it exactly right or break something, or act in a bad way, we can be forgiven. As long as we’re truly, deeply sorry, we can grow into better people. But at the same time, you need to know how to act and to use your common sense,” I explained, ’cause I really don’t need any parents calling and asking me why their child said I told them they’d be forgiven for poking holes in the sofa cushions with a pair of chopsticks because it wasn’t expressly forbidden in the Torah. More nods, and I felt like we’d really accomplished some Jewish learning here today. We moved onto snack, a rousing rendition of the “Dovid Melech Yisrael” hand jive, and to illustrate the “hand of God,” this super cool hamsa project. Unfortunately, it required some basic adhesive skills and therefore turned out stickier than I imagined, but it was nothing an entire packet of Tough N’ Tender cleaning wipes couldn’t handle. I think next week we’ll just start with how to use a glue stick. This entry was posted in Life, Death and Guilt In Between, The Weirdest Sunday School Class in the South by Head Yenta. Bookmark the permalink. Bwaaaaa ha ha ha ha! I’m sorry Sam wasn’t there to worship the hands of American Idol with you guys! is one career I didn’t envision for you but you are rockin’ those 5 yr. old worlds! Such a lovely blog post! I’m so glad you chose to share it. I truly like this post, the message composed in this clause is very valuable. I appreciate the indite and his efforts to provide information most subject. It is a very well-published document and is quite in depth and exact. The author has command through the theme and it is a effectively-researched article. You will delight in the message and could bring about data in sluggish and understandable way.